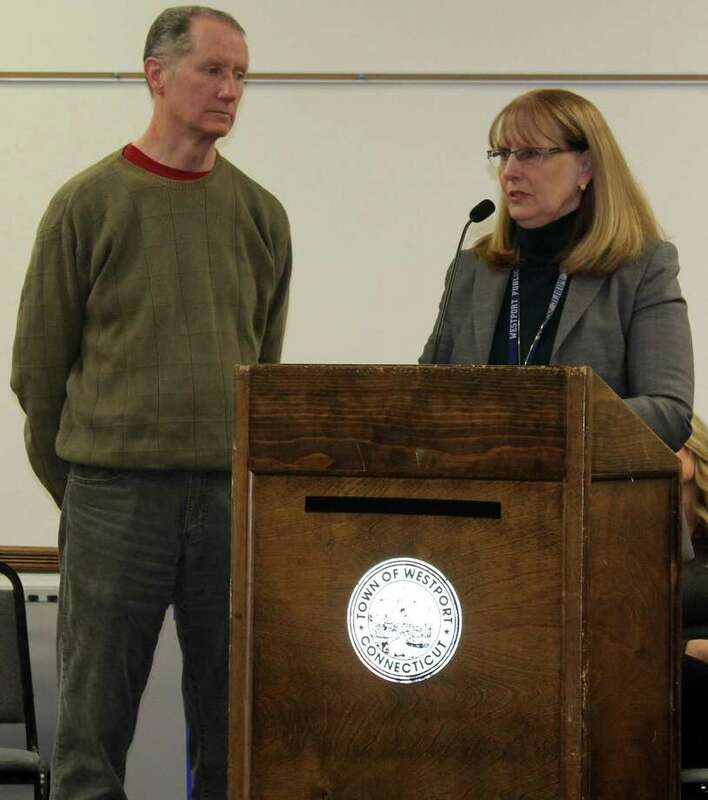 Westport Public Schools Superintendent Colleen Palmer asked the Board of Finance to appropriate four million dollars for the purchase or rental of portable classrooms for the elementary schools at the board's Feb. 5 meeting in Westport Town Hall with education board Chair Mark Mathias by her side. WESTPORT — A survey released just days before the announcement of Superintendent Colleen Palmer’s resignation shows widespread discontent, distrust and concern among Westport school administrators. The Westport Intermediate Administrators Association union sent the survey to its members, which include about 40 Westport principals, assistant principals, department heads and senior administrators from across the town’s eight schools. About 30 administrators responded to each of the survey’s 11 questions, and on March 8 the WIAA sent the survey results to the Board of Education, BOE Chairman Mark Mathias said. About a week later, on March 14, Palmer announced her resignation. Although the education board has not made the survey results public, the Westport News acquired the results from multiple sources familiar with Westport school operations. In response to the statement, “I have concerns about the ethics and integrity of our current Central Office leadership,” 90 percent of respondents said they agree, while only 10 percent said they disagree. Eighty percent of administrators who responded said their voice is not being heard, and 70 percent they would accept an administrative position elsewhere if an opportunity arose. On March 8, the same day the BOE received the survey, Staples High School Principal James D’Amico did just that and announced he will be leaving Westport at the end of the year to become principal at New Fairfield High School. “During the regular monthly meetings between our administrators’ union and district leadership and in the countless meetings that our Central Office team has had with administrators throughout the district this past year, any issue brought forward was taken seriously and addressed,” Palmer said in an email Wednesday. The committee, not yet named, includes six of the BOE’s seven members, with only Vik Muktavaram opting not to join the group, Mathias said. Meanwhile, on Monday, the BOE established a search committee for the next superintendent, which Mathias said will be similar to the national search completed three years ago when then-Superintendent Elliott Landon left after a 17-year tenure and was replaced with Palmer.